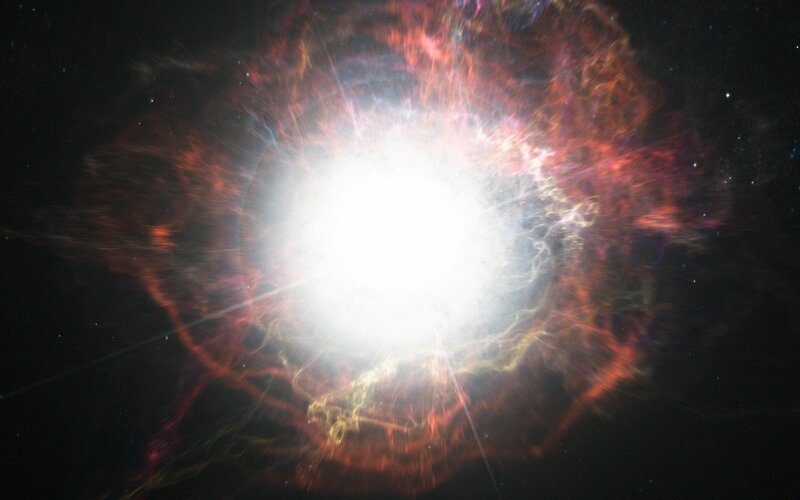 A group of astronomers has been able to follow stardust being made in real time — during the aftermath of a supernova explosion. For the first time they show that these cosmic dust factories make their grains in a two-stage process, starting soon after the explosion, but continuing for years afterwards. The team used ESO's Very Large Telescope (VLT) in northern Chile to analyse the light from the supernova SN2010jl as it slowly faded. The new results are published online in the journal Nature on 9 July 2014. The origin of cosmic dust in galaxies is still a mystery . Astronomers know that supernovae may be the primary source of dust, especially in the early Universe, but it is still unclear how and where dust grains condense and grow. It is also unclear how they avoid destruction in the harsh environment of a star-forming galaxy. But now, observations using ESO’s VLT at the Paranal Observatory in northern Chile are lifting the veil for the first time. An international team used the X-shooter spectrograph to observe a supernova — known as SN2010jl — nine times in the months following the explosion, and for a tenth time 2.5 years after the explosion, at both visible and near-infrared wavelengths . 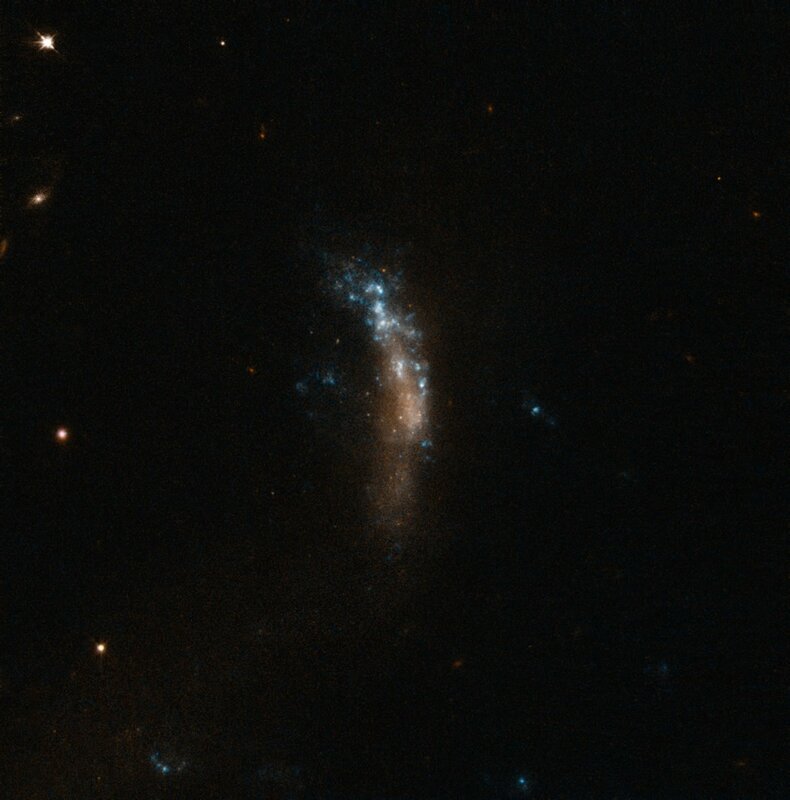 This unusually bright supernova, the result of the death of a massive star, exploded in the small galaxy UGC 5189A. The team found that dust formation starts soon after the explosion and continues over a long time period. The new measurements also revealed how big the dust grains are and what they are made of. These discoveries are a step beyond recent results obtained using the Atacama Large Millimeter/submillimeter Array (ALMA), which first detected the remains of a recent supernova brimming with freshly formed dust from the famous supernova 1987A (SN 1987A; eso1401). The team found that dust grains larger than one thousandth of a millimetre in diameter formed rapidly in the dense material surrounding the star. Although still tiny by human standards, this is large for a grain of cosmic dust and the surprisingly large size makes them resistant to destructive processes. How dust grains could survive the violent and destructive environment found in the remnants of supernovae was one of the main open questions of the ALMA paper, which this result has now answered — the grains are larger than expected. But the astronomers think they know where the new dust must have formed: in material that the star shed out into space even before it exploded. As the supernova's shockwave expanded outwards, it created a cool, dense shell of gas — just the sort of environment where dust grains could seed and grow. Results from the observations indicate that in a second stage — after several hundred days — an accelerated dust formation process occurs involving ejected material from the supernova. If the dust production in SN2010jl continues to follow the observed trend, by 25 years after the supernova, the total mass of dust will be about half the mass of the Sun; similar to the dust mass observed in other supernovae such as SN 1987A. “Previously astronomers have seen plenty of dust in supernova remnants left over after the explosions. But they also only found evidence for small amounts of dust actually being created in the supernova explosions. These remarkable new observations explain how this apparent contradiction can be resolved,” concludes Christa Gall. Cosmic dust consists of silicate and amorphous carbon grains — minerals also abundant on Earth. The soot from a candle is very similar to cosmic carbon dust, although the size of the grains in the soot are ten or more times bigger than typical grain sizes for cosmic grains. 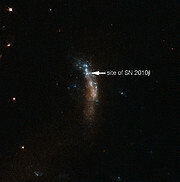 Light from this supernova was first seen in 2010, as is reflected in the name, SN 2010jl. 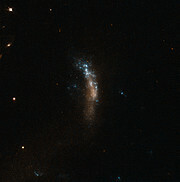 It is classed as a Type IIn supernova. Supernovae classified as Type II result from the violent explosion of a massive star with at least eight times the mass of the Sun. The subtype of a Type IIn supernova — “n” denotes narrow — shows narrow hydrogen lines in its spectra. These lines result from the interaction between the material ejected by the supernova and the material already surrounding the star. This research was presented in a paper “Rapid formation of large dust grains in the luminous supernova SN 2010jl”, by C. Gall et al., to appear online in the journal Nature on 9 July 2014. The team is composed of Christa Gall (Department of Physics and Astronomy, Aarhus University, Denmark; Dark Cosmology Centre, Niels Bohr Institute, University of Copenhagen, Denmark; Observational Cosmology Lab, NASA Goddard Space Flight Center, USA), Jens Hjorth (Dark Cosmology Centre, Niels Bohr Institute, University of Copenhagen, Denmark), Darach Watson (Dark Cosmology Centre, Niels Bohr Institute, University of Copenhagen, Denmark), Eli Dwek (Observational Cosmology Lab, NASA Goddard Space Flight Center, USA), Justyn R. Maund (Astrophysics Research Centre School of Mathematics and Physics Queen’s University Belfast, UK; Dark Cosmology Centre, Niels Bohr Institute, University of Copenhagen, Denmark; Department of Physics and Astronomy, University of Sheffield, UK), Ori Fox (Department of Astronomy, University of California, Berkeley, USA), Giorgos Leloudas (The Oskar Klein Centre, Department of Physics, Stockholm University, Sweden; Dark Cosmology Centre, Niels Bohr Institute, University of Copenhagen, Denmark), Daniele Malesani (Dark Cosmology Centre, Niels Bohr Institute, University of Copenhagen, Denmark) and Avril C. Day-Jones (Departamento de Astronomia, Universidad de Chile, Chile).